New Customers: Get Free Shipping on your very FRIST order – continental US. Applies to first-time customer within continental US. This does not apply to Alaska, Hawaii, Puerto Rico and Canada. NOTE: Under SHIPPING METHOD, the Free Shipping BUTTON is pre-selected for your convenience. Do NOT change to other shipping options, if you want Free Shipping. • And, remember to enroll in Repeat Delivery to continue to get Free Shipping on your monthly order. Expedited Delivery: There is a fee for expedited shipping. Select a different option (example: UPS 3-Day Air), and pay the amount listed. 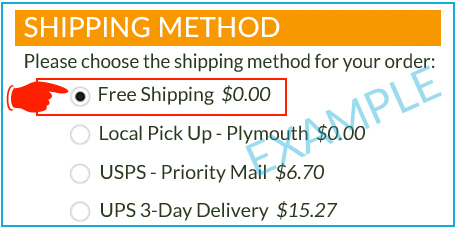 Always Free Shipping: Already a customer? Simply create a convenient Repeat Delivery for the products you like. Then, get free shipping on your order in the Continental US. You can easily change product selections or cancel anytime. Your Repeat Delivery order will be processed on the future date selected in the same month you set it up, unless an order of equal or greater value has already been processed that month. Otherwise it will be processed on that day the following month. Setting up your Repeat Delivery is done separately from placing a regular order. If you need products right away, proceed with placing a normal order. Then, go back and set up your Repeat Delivery to be shipped to you a month later. Repeat Delivery cannot be scheduled while you are in the process of placing an immediate order. Easier, simpler and faster. That's what most of us are looking for in our lives (at least the easier and simpler part). That's why Eniva Repeat Delivery is really a no-brainer. It's the easiest and most convenient way to get your products delivered automatically to your door. The products you like and use arrive every month, just like clockwork. No more emergency trips to the store, and no more frantic calls to expedite your order. Most importantly, you don't have to stop your wellness routine. No more going without or rationing your wellness products because you ran out unexpectedly. Save Money. Save Time. Be Smart. More Rewards: While on Repeat Delivery, you get double the amount of Customer Reward Points for your orders than those not on Repeat Delivery. Use these rewards same as cash on future purchases. Convenience: Don't get stuck on the phone calling each month to re-order. Just select the products you want and get them the same time each month! We offer 6 convenient dates to choose from, and you can change dates at any time. Flexibility: You can change your products or cancel at any time and you'll never be penalized for any past discounts or purchases. Ease: If you need to add or remove products on your Repeat Delivery, just log into your personal account online – it literally takes less than 5 minutes! Scroll down and click on the ORANGE "Manage Repeat Delivery" button. Shop for the item(s) you want, and enter the desired quantity. Click on the blue "Add Item" button under that product. Repeat step 2 for each product you wish to receive on Repeat Delivery. Scroll down to review your Repeat Delivery order. If there is a product you want to remove from your Repeat Delivery, click on the red "Delete" button next to that product. Select the date and frequency you would like your order to process. Enter your payment method and shipping details. When completed and reviewed for accuracy, click the "Submit" button. To review or edit your Repeat Delivery, click on "Manage My Account" (at top of pages), and scroll to "Manage Repeat Delivery" button. NOTE: In order to UPDATE a Repeat Delivery, you must have at least one item in your CART for changes to take effect. To cancel Repeat Delivery, scroll down to Terms and Conditions below. Please Note: Your Repeat Delivery order will be processed on the future date selected in the same month you set it up, unless an order of equal or greater value has already been processed that month. Otherwise it will be processed on that day the following month. We strongly urge customers to review Repeat Delivery order information at least 48 hours prior to its set processing date to ensure all products, addresses and payment information is correct. All the Eniva products are available for Repeat Delivery. From time to time, Eniva may offer a special seasonal, limited-time offer product or a specially-priced package. Those items are not available for Repeat Delivery. A note will be provided in the item description of that product stressing it is not a Repeat Delivery item. After you have set up your Repeat Delivery, you can easily change it by logging into your personal Eniva account, then click on "Manage My Account" and select "Manage Repeat Delivery" from the menu. In order to UPDATE a Repeat Delivery, you must have at least one item in your CART for changes to take effect. Repeat Delivery customers receive our guranteed lowest online prices on items eligible for Repeat Delivery. If an item is on sale at the time of your scheduled delivery, those savings will automatically be applied toward your order. Repeat Delivery orders are also given top priority, and are fulfilled and shipped out prior to regular non-Repeat Delivery orders. Due to the nature of how Repeat Delivery is constructed, limited-time or seasonal promotional offers do not apply to Repeat Delivery orders. There may be some occasional exceptions to this policy. Always check the Terms of the offer on the website. At the beginning of each month, your account will be awarded EXTRA Eniva Customer Reward Points as a Thank You for being a Repeat Delivery customer. These points will equal an additional 1% of your monthly purchase -- for a total of 2% -- received back in Points equivalent. These points can be redeemed for future discounts. Your Reward Points earned from the previous month's order will automatically be used on your next Repeat Delivery unless you choose otherwise. *Free ValueShip (standard ground) shipping, up to 40 pounds, is provided on all Repeat Delivery orders. Free standard ground shipping, is provided for all first time orders of new customers (continental US) – does not include Alaska, Hawaii, Puerto Rico or Canada. Free shipping does not include expedited (UPS Ground, USPS Priority or UPS Air) shipping methods. Your Repeat Delivery will process at the designated time you've selected each month unless an order of equal or greater dollar value is placed prior to the time the Repeat Delivery is set to process. However, we strongly urge you to simply edit your Repeat Delivery products and process date so you can still receive free shipping and handling on your order. To cancel, please scroll down under Terms and Conditions. 1. Repeat Delivery (AutoShip) option will continue monthly until a cancellation request is made. NOTE: Deleting all contents/emptying of the cart completely and trying to save will NOT update the cart and will NOT CANCEL the Repeat Delivery order. You may "take a break" on your Repeat Delivery by requesting Skip-A-Month which changes your delivery frequency on your account. – CALL Eniva Customer Care/Service at 866-999-9191, press 1, OR 763-795-8870 for this request. NOTE: Skip-A-Month changes are completed only by CALL-IN requests. 2. Should the credit card on file for your Repeat Delivery be declined, it is Eniva's policy to attempt to successfully process your Repeat Delivery again during the month. We will contact you via email if your Repeat Delivery cannot be processed. 3. Members who wish to be eligible for “Friendship” referral rewards on repeat orders of customers they have referred, must also be on Repeat Delivery themselves. 5% rewards are given if autoship is more than $89 in product; 2% rewards are given if Repeat Delivery is less than $89 in product. 4. If an order of equal or great value is placed prior to the normal processing date of your Repeat Delivery order, then your regularly scheduled Repeat Delivery order will not process that month. 5. Free Shipping on Repeat Delivery is awarded for those Autoships that process automatically. If you choose to call in and place an order in lieu of your Repeat Delivery, the Free Shipping may not apply; a one-time discretionary free shipping courtesy may be given.